RANTWICK - Commuter Cycling in London Ontario | A Bike Blog: WTF Strikes Again. 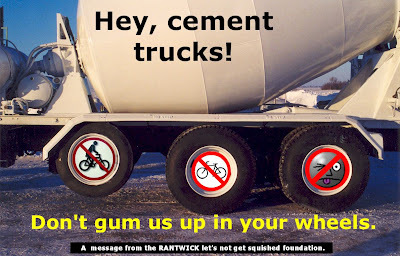 Anyway, I was reading those comments when a frequent visitor and commenter on this blog, Chipseal, said this in one of his entries regarding cement trucks: "whatever helps keep casual people on bikes from getting gummed up in the wheels can’t be too negative". I laughed about it in the comments, suggesting it could be turned into a Public Service Announcement (PSA). That's when WHAM! I was struck once again with WTF, or Word-To-Form syndrome. When this happened last time, I likened it to an earworm, which is when a song gets stuck in your head and won't get out, except this is a mental image that won't go away. Comments on the post featuring my first bout of WTF, Captain Jack Sharrow, were very educational, and put a name to the strange thing I was experiencing. It was such a comfort to know that I was not alone in my affliction. Anyway, a PSA poster-style image sprang to mind, and I know already that it is something that will not let me be until I let it out. It is well known that the only known cure/relief for WTF is actually creating the image and, ideally, posting it on the Internet. As with that stupid sharrow thing, I'm asking your forgiveness for what follows. I am becoming more realistic about my struggle with WTF. It may happen again. If you are the kind of person who might follow this blog, please know that WTF may occur. I don't welcome it, but I must accept and deal with it. This is erie - I was thinking about a post about cement trucks and their drivers - and I didn't even SEE that ChipSeal comment. You know, I should have also echoed Chipseal's good vibes for most big truck drivers, concrete trucks included... they are professionals who know what they are doing who won't squish you so long as they can see you. People kept warning me about logging trucks when I toured on the west coast many years ago. Without exception the log trucks worked well with me. The dump trucks were less reliable. The vacationers in motor homes were the homicidal ones. Through the years I have had bad encounters with occasional tractor-trailers. Foliage tour bus drivers seem to have a mean streak as well, perhaps because their human cargo has already eroded their patience. Strangely, school bus drivers don't exhibit the same aggression. You'd think they'd be ready to smack someone. I don't believe you could be a school bus driver for long without achieving some sort of alert/zen approach. There's one other very dangerous beast out there, the rented (U-Haul, etc.) cube van. For the most part, professional truck drivers make fewer mistakes than cyclists. Most of the crashes I've red about involved the cyclist riding into a turning truck. Dump truck drivers are the worst for general reckless driving because they get paid by the load. During the housing bubble when developers were carving up exurban land as fast as they could get their greedy paws on it, the dump truck drivers were the menace of every weekend ride. 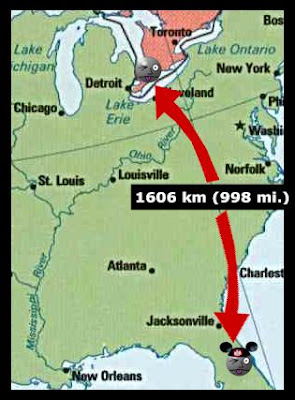 They're mostly gone now, but the angry rednecks are an increasing menace. What used to be pastoral countryside is still reverberating from the instability—and incivility—of rapid growth, and now rapid contraction. In town, I haven't had problems with truck drivers. I have occasional problems with bus drivers. Some readers report issues with school bus drivers, but I haven't had any. The rented box truck with wide mirrors and incompetent driver is a problem. The utility/landscaper trailers are the biggest problem. Those trailers are indeed brutal. FOR YOUR INFORMATION, it was "Photoshop Elements," NOT Photoshop. I only have Photoshop on the Mac. AND, to clarify, I'll cut MY cement truck drivers more slack than almost anybody else. It's cafiend and Keri that have hit on the REAL truth - unlike the Amish in Ohio, cycling commuters have to worry about the "tourists," not the locals. Durn, now readers of this post have the chance to beat me to the punch to expound on the truth. Oh, well, to paraphrase a popular skiing bumper sticker - "If Hell freezes over, I'll comment there too!" Oh Yeah? I don't use photoshop anything! Put that in your Mac and smoke it! I use this strange little program that used to ship with MS Frontpage called Microsoft Image Composer. The rest of your comment just confused me. Among other things, count the wheels. Went there, counted, commented. Thanks Steve! I just thought I'd let you know: Rantwick cracked into the "My 5 Favorite Bike Blogs" list over on Beginning Bicycle Commuting. Rantwick rocks! Doohickie - You are one nice dude. Thanks very much.